Coral Keen is an accomplished International event rider who always has availability for new rides, whether your horse needs a change of scenery, or you have a horse ready to be broken in and start its competitive career. Coral made her four star debut at Land Rover Burghley in 2014 riding Wellshead Fare Opposition. In 2016, the same combination finished 15th at Luhmuhlen CCI4*. She has also represented Great Britain on three occasions on Nations Cups team at Waregem in 2015, Houghton Hall in 2016 and Strzegom in 2018. 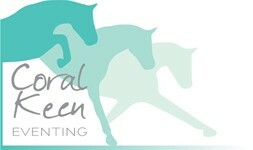 Coral is based near Devises in Wiltshire and her yard is a mix of her own horses and those she rides for owners. Along with this she runs a busy livery yard and is in demand as a trainer of all levels of riders, from Pony Club to those climbing the eventing ladder. With her father Steven, whose business Total Equestrian Construction sponsors the yard, she has in place a carefully structured sport horse breeding programme with progeny carrying the prefix Total. There are now several Total horses competing on the eventing circuit. The 2018 season saw Total Belief, aged eight, contesting CIC*** classes and Total Darkness being well placed at Hartpury CCI*. Wiltshire based. Get in touch to talk through price packages that would work for you. This is a chance to be part of a really fun team, with plenty of opportunities. Please visit my website for full job description and how to apply.